Full Geometry and corner weighting services available on site. We have recently installed a top spec HUNTER 4 wheel laser alignment setup on site in addition to corner weighting facilities. From a basic setup to full camber/castor/toe setup available. We can also hire the facility if required. Printouts of before/after adjustments available too. 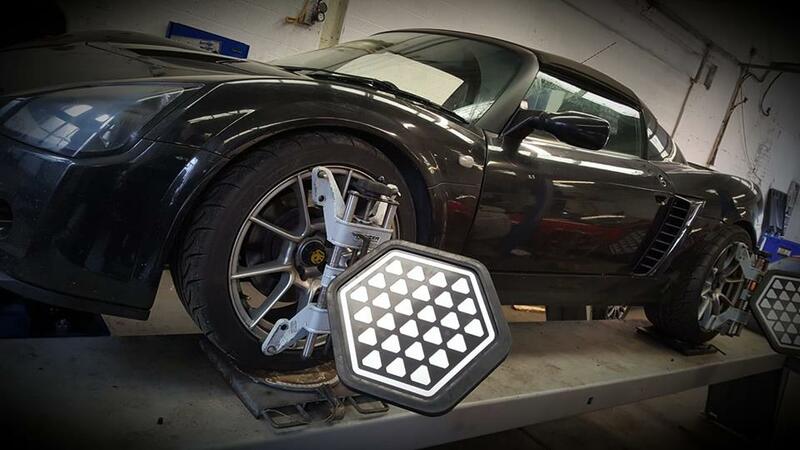 We offer a full range of geo setup services/pre and post trackday checks and more. If you are a trackday regular looking for setup help or advice our knowlegable staff can assist with sensible advice on anything from suspension setup to tyre pressures. If you are new to trackdays we can offer friendly uncomplicated advice on changes and upgrades to suit your budget and intended use of the car. We can also build a car to suit your requirements. Recent projects include track only VX220’s and Honda K20 powered Elise/Exige. We are authorised distributors of Nitron/Gaz/Spitfire Engineering products and can supply and fit any suspension system you require.